Recently, a piece of news titled "Army Special Operations Command reportedly ditching Android for iPhone in the field" from Techcrunch draws great attentions from the masses. It's reported that the Android based Samsung Galaxy S7 lags, freezes, and needs to be restarted too often; the iPhone 6s, apparently, is faster and smoother, let alone more advanced iOS 10 iPhone 7 with numbers of iPhone 7 pros revealed already. On this point, we can see iPhone 7 already knocks the spots off Galaxy S7. Samsung S7 or iPhone 7? You may wonder besides this, how about other sides when comparing iPhone 7 with Galaxy S7? Does it really mean Galaxy S7 is good for nothing? Okay, to remove your puzzles, here gathers overall information and compare them in detail. The new-gen processor A10 Fusion powers Apple new iPhone 7. With the new A10 Fusion clips with 64-bit architecture and also M10 motion coprocessor, iPhone 7 (& iPhone 7 Plus) is 2x faster than iPhone 6, and 40% faster processing than the A9 in iPhone 6s, making iPhone 7/Plus the most powerful iPhone when it comes to movie streaming or gaming etc. Also 2GB of RAM and 32 GB starting storage are available. But you don't expect too much, cuz there is still no card slot for you to expand iPhone 7 space with microSD. And iPhone X has even much more powerful processor, iPhone X vs Samsung Galaxy S8, who wins in 2017? Compare iPhone 7/Plus and Samsung Galaxy S7, the latter will work on a 64bit Exynos processor and 8GB RAM. That is even larger than your laptop or desktop and thus will provide improved performance. And Galaxy S7 empowers you to expand your storage memory with an additional up to 256GB with a single or dual-microSD card for you to choose if 32GB isn't enough for you. Speaking of the memory, it seems that Samsung Galaxy series always dwarf iPhone series, not only Galaxy S7 and iPhone 7/Plus. It's a common failing for iPhones with no microSD card slot. Thankfully, there is a silver lining that you can help your iPhone lose weight and free up space on iOS iPhone to solve iPhone insufficient memory problem. To make this happen, you can consider to resort to a professional iPhone cleaner like MacX MediaTrans, which is capable of transferring and backing up files from iPhone 7/Plus/6s/SE iOS 10 to Mac computer so that you can delete the excessive yet large-sized files like 4K videos, HD photos and high quality music, etc. to free up your iPhone 7 space. The new Apple flagship iPhone 7 and iPhone 7 Plus is eventually released at Apple annual launch event in San Francisco on September 7. The iPhone 7/7 Plus come in with 32GB, 128GB and even 256GB variants with price at $649 for the 32GB model, $749 for 128GB and $849 for 256GB respectively. If you want to switch to new iPhone released in 2017, check iPhone X vs iPhone 8. 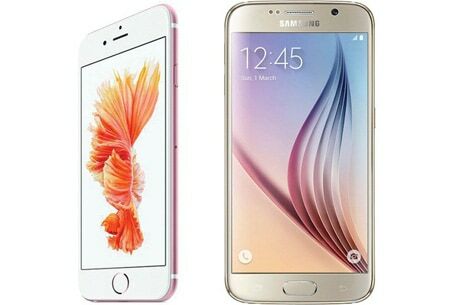 The release dates are quite close when it comes to iPhone 7 and Galaxy S7 while Samsung is released on Feb.22, 2016. 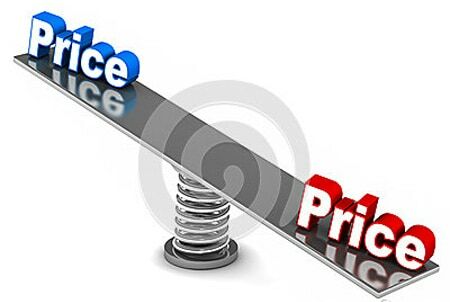 Compare iPhone 7 and Samsung Galaxy S7 in the price tag, it seems iPhone 7 wins out as Galaxy S7 is available at price of $670 to $699 depending on your carrier. As one of the best 2016 smartphones, iPhone 7's display stay quite close to its predecessor in size and resolution. It also comes in two variants: a 4.7in and 5.5in screen but 25% brighter than iPhone 6s. Comparing iPhone 7 with Samsung in this respect, a Retina HD display with resolution of 1334-by-750-pixel resolution at 326 ppi and 1920-by-1080-pixel resolution at 401 ppi is available on iPhone 7 and 7 Plus respectively. And the advanced version of Force Touch found in Apple Watch 3D Touch also comes with iPhone7/7 Plus. As for the colors, Black and jet black are added in the iPhone 7 family while the Space Grey model is cancelled. 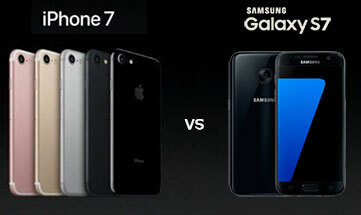 Compared with Apple, Samsung is mainly dominant in making beautiful and HD display, so how about the fight between iPhone 7 and Samsung Galaxy S7? The Galaxy S7 has a 5.1 inch Quad HD super AMOLED display, edge-curved. This Galaxy S7 vs Apple iPhone 7 round seems to go into a tie in the resolutions and new features. 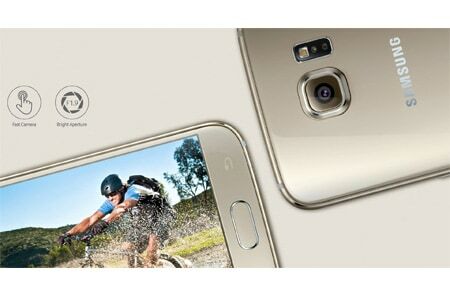 Will the 3D screen beat the curved screen? It's your call. But one thing is for sure, both devices are ideal to enjoy movies videos on. Feel free to download movies to iPhone 7 or Galaxy S7 and transfer media contents to iPhone 7 & Samsung Galaxy S7 with the aid of mobile devices video converter. A Virtual Reality (VR) video camera named Gear 360 was released together with Samsung Galaxy S7/edge. The vr movies shoot with Gear 360 can be transmitted wirelessly to Galaxy S7/S7 edge, where the software on the phone can handle the shoot videos. Then you can view them on the phone or drop the phone into the Samsung Gear VR headset where the phone becomes the screen. Compared with Galaxy S7, iPhone 7 seems to be not quite sure. There are rumors saying that iPhone 7 will come with VR compatibility, and this is also what many users' hope with Apple's next flagship. If Apple will make the iPhone 7 VR-compatible, iPhone 7 and Samsung Galaxy S7 fight to a draw, or Galaxy S7 will have an advantage over iPhone 7 in this regard. iPhone 7 will ship with the much-awaited iOS 10. After iOS 10 update on iPhone 7, users can enjoy a slew of benefits, including the stability improvements, bug fixing, size reducing and various new features. Of course, speaking of iOS 10, you can update your iPhone 6s iOS 9 to iOS 10, but prepare well for iOS 10 problems after update. Now, you can update to iOS 11 on iPhone 7. For Samsung Galaxy S7 vs iPhone 7 in this regard, Galaxy S7 on the other hand, comes out to pair with the new Android 6.0 M OS rather than the current Android Lollipop. The Android M 6.0 arrives with improved notification features as well as Android TV and Android Auto support. 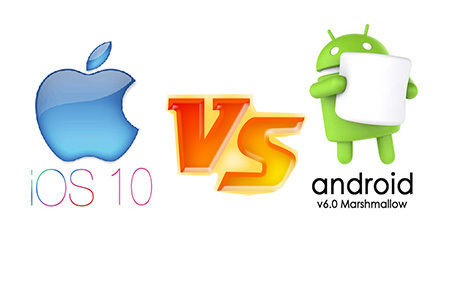 Without doubt that both OS will bring some improvements and exciting new features, and the favored OS between iOS 10 and Android 6.0 M will determine the winner of iPhone 7 vs Galaxy S7 comparison. The ability to taking pictures is another main battleground in the Apple iPhone 7 vs Samsung Galaxy S7 battle. The Samsung Galaxy S7 will house the best Android camera. Exactly, Galaxy S7 sports with a 12MP rear camera with dual pixel and 5MP front camera. Apple responds to this strongly: 12 megapixel iSight camera rather than the 8-megapixel sensors in previous iPhones and a 7-megapixel FaceTime HD camera with Retina Flash. The iPhone 7 Plus offers a dual-camera system with double 12MP cameras on the back. Besides, iPhone 7 comes with optical image stabilization (OIS) and 4K video recording ability at 30fps. It will be a tough choice between Galaxy S7 and iPhone 7. But Apple also adds 4K recording in the camera, which gives iPhone 6S/7 an extra advantage over Samsung Galaxy S7. Both Apple and Samsung users have problems with battery life of the handsets and questions about how to improve iPhone battery life as well as Android's are popping out now and then. It's a common wish of users that both iPhone 7 and Samsung Galaxy S7 will come with better battery life. Apple iPhone 7 battery gets improvement, up to 2 hours longer than iPhone 6s and iPhone 7 Plus 1 hour longer than iPhone 6s Plus, but Samsung makes a big step forware for Galaxy S7's battery life, with 3000 mAh battery and 3600 mAh for Galaxy S7 edge. Verdict: Through the above comparison between iPhone 7/7 Plus and Samsung Galaxy S7, you may have a rough understanding of the differences between the two devices. While it's too early to figure out which is the better smartphone in iPhone 7 vs Galaxy S7 fight, one thing is for certain. Two series players are going to bring surprise to consumers in 2015. Tips: If you want to enjoy HD videos or DVD movies on iPhone 7 or Samsung Galaxy S7 or any other phones and tablets, considering the incompatibility of the mobile devices to support certain files like MKV, MTS, FLV, MOV etc, you will need a professional HD video converter or DVD movie ripper to get the contents to your mobile devices without losing any quality.